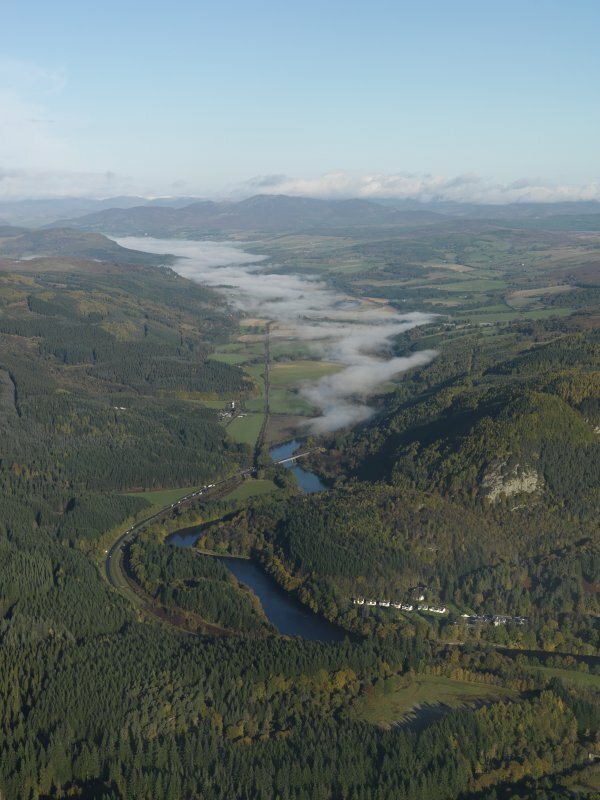 General oblique aerial view looking along a mist-shrouded River Tay, taken from the S.
Plane-table survey: fort at King's Seat, Dunkeld (sheet 3). Inked drawing: fort at King's Seat. 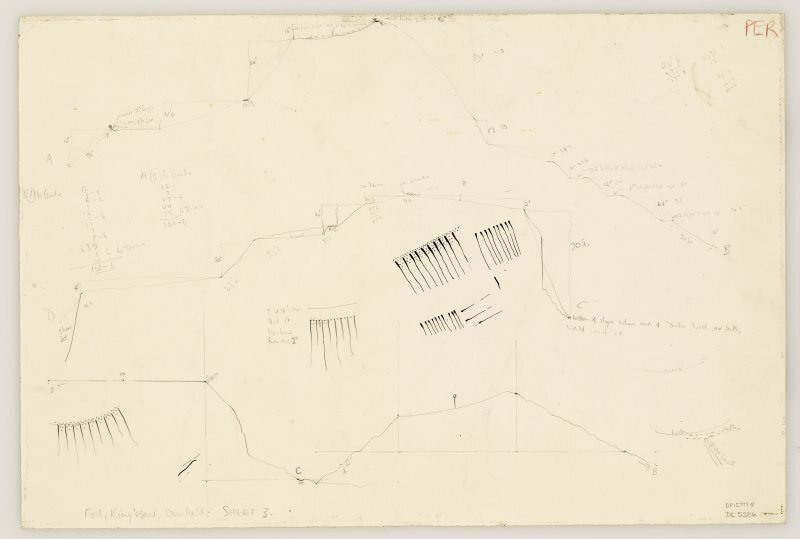 Plane-table survey: fort at King's Seat, Dunkeld (sheet 2). 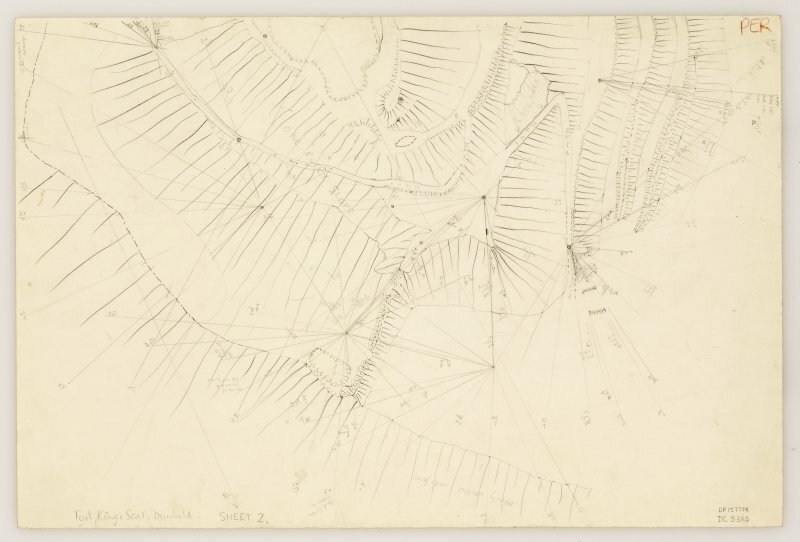 Plane-table survey: fort at King's Seat, Dunkeld (sheet 1). 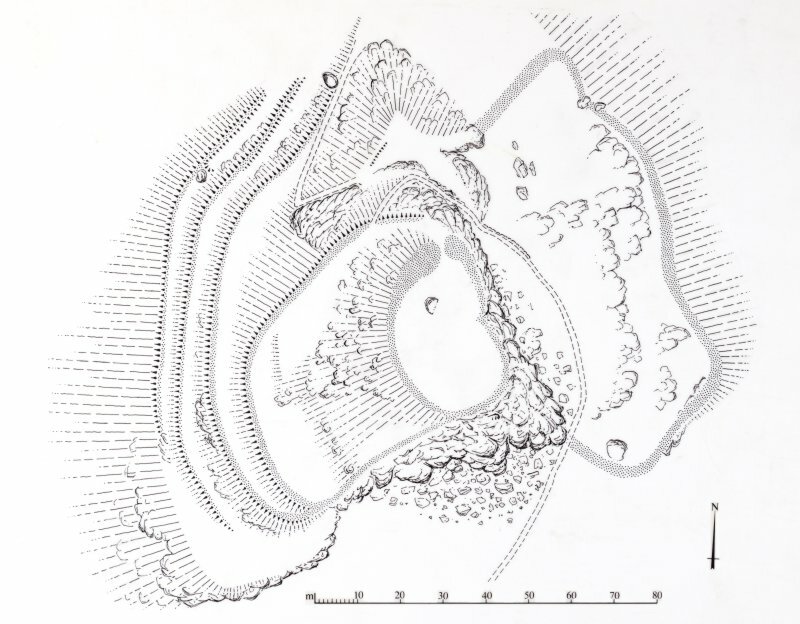 Publication drawing; King's Seat fort. 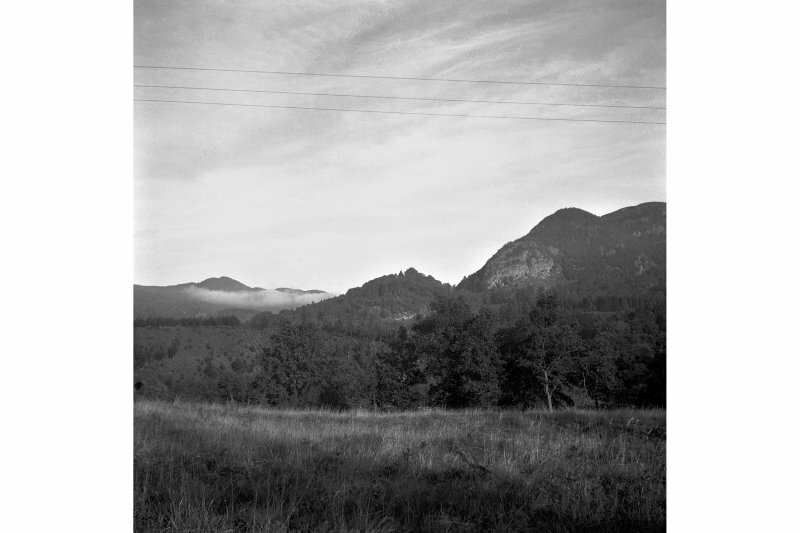 King's Seat, Dunkeld -'The Fort of the Caledonians' - consisting of a walled inner enclosure crowning a rocky bluff and measuring axially only 115' by 70', strongly defended by natural rock-faces, precipices and four ramparts. Sources: W J Watson 1926; RCAHMS 1963; R W Feachem 1966. 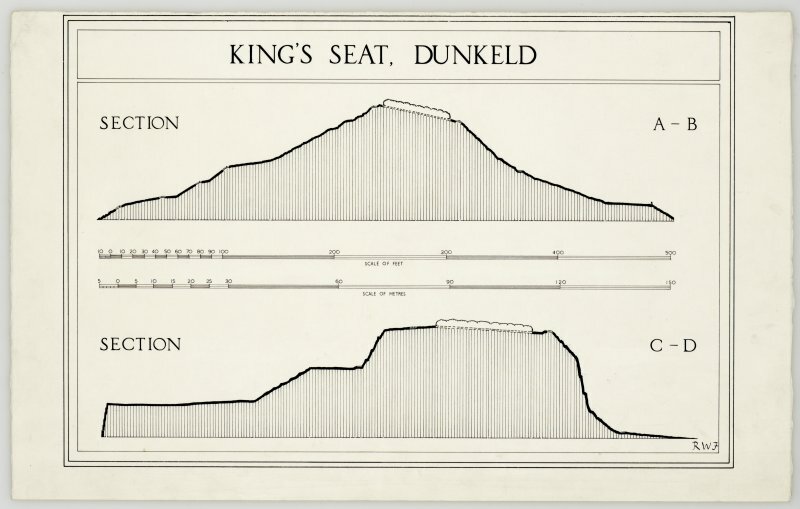 King's Seat, as described above. 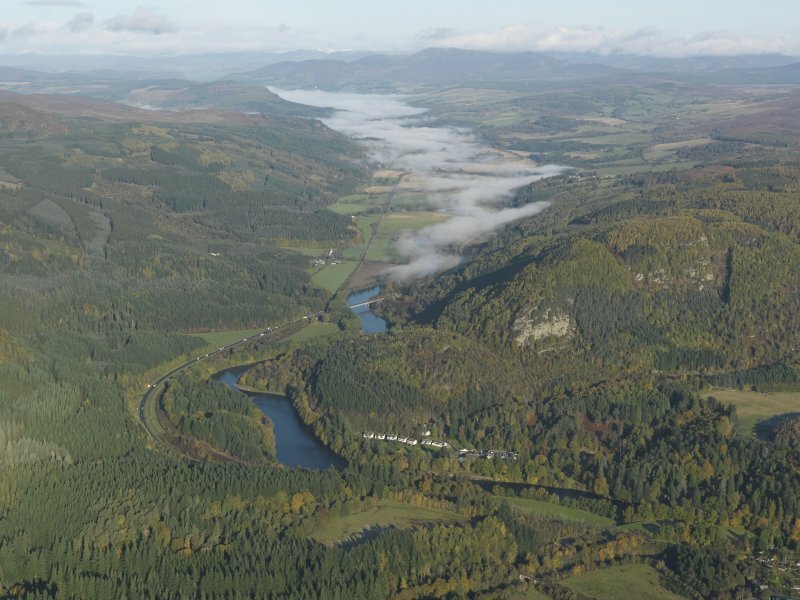 This fort is situated on the summit of King's Seat, a craggy hill on the N side of the River Tay. It has been planted with trees and the summit area is heavily overgrown with rhodedendrons; the present plan is based on the earlier published survey (by Feachem). The defences of the fort comprise a central citadel occupying the summit of the hill and a series of ramparts taking in lower terraces. The citadel measures about 35m by 22m within what are probably the remains of a thick wall. The entrance is on the N and there appears to have been a trackway dropping down to a lower terrace on the W; the trackway and the terrace are edged by a rampart reduced to a stony bank up to 4m in thickness by 0.4m in height, its S end resting on the lip of a precipitous cliff. Below this terrace, on the W, the approach to the fort is partially blocked by three rampart-like features, which form a flight of terraces levelled into the slope; occasional stretches of internal quarry-scoops are visible, and the leading edge of each terrace appears to have been capped with a layer of gravel and stones. Surprisingly, these terraces have only been drawn around the steeper part of the slope and do not extend across the more vulnerable ground on the N; it is possible that they are no more than landscaping features, added along with a number of carefully-constructed pathways when the policies of Dunkeld House (NO04SW 59) were laid out. Nevertheless, there are traces of other outlying ramparts; a small terrace below the entrance on the N side of the citadel has been defended, while a lower terrace on the E has also been enclosed, its perimeter forming a substantial bank up to 5m in thickness by 1.2m in height on the N, but elsewhere reduced to much slighter proportions and overlain by a narrow stone dyke. Visited by RCAHMS (JRS) 3 April 1989. NO 0093 4303 At the N end of the summit (27 x 17m) is a circular enclosure 10m in diameter over a 3m wall, which incorporates the rock outcrop on E. At the lower level N, where the plan in South-east Perth – an archaeological landscape 53 shows an entrance, the E arm is offset 4m N.
This fort is situated in the tangled woodland and undergrowth that clothes the King's Seat, a craggy hill commanding the narrow exit of the River Tay from the highlands beyond the facade formed by the Highland Boundary Fault at Dunkeld. 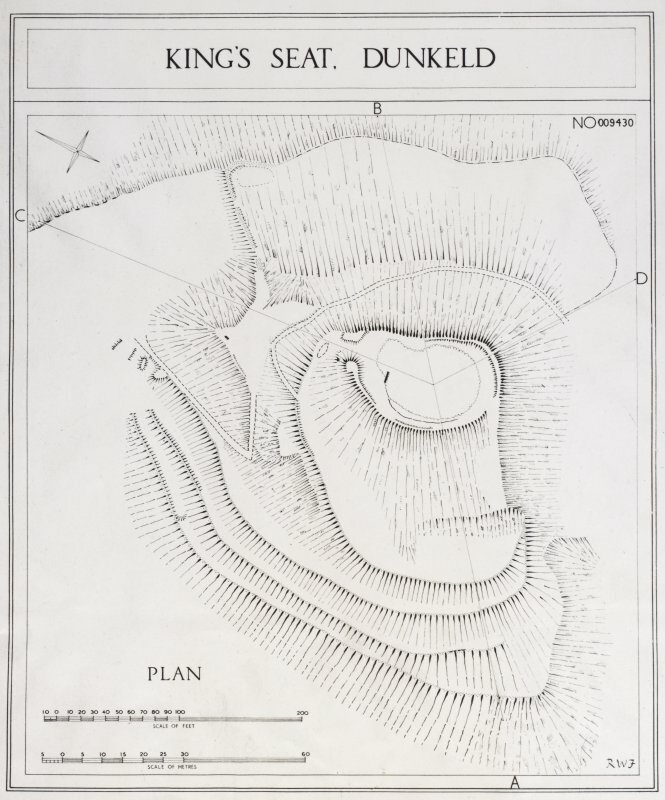 Translated by William Watson as 'the Fort of the Caledonians', its defences appear to comprise several elements descending from an oval enclosure on the summit, and are usually conceived as a citadel with subsidiary enclosures, though there is no secure evidence to sustain this interpretation. The summit enclosure measures 35m from N to S by 22m transversely (0.06ha) within the remains of what is probably a thick wall; an entrance on the N opens onto a trackway dropping down at the rear of a second wall or rampart to a lower terrace on the W. This second rampart extends along the lip of the terace before returning back up the edge of the crag on the S to the summit to enclose an overall area measuring 55m from NE to SW by 45m transversely (2.2ha). Immediately below this rampart on the W there is a flight of what appear to be three ramparts with internal quarry ditches, though curiously they seem only to block access up the very steepest slopes, petering out on the gentler ground to the N, and it is possible that these are an antiquarian confection to enhance the presence of the fort in the designed landscape of paths and walks laid out in the policies of Dunkeld House. Nevertheless, a short length of rampart can be seen on a terrace below the summit on the N, and from the foot of the outcrops on its NE another thick bank surmounted by a narrow wall loops out to take in a lower terrace below the crags to form an annexe measuring about 90m from NNW to SSE by 40m transversely (0.35ha). The modern pathway that mounts the summit via these terraces is perhaps marking the original route into the interior. NO 0093 4303 (NO04SW 19) The scheduled monument of King’s Seat Hillfort (SM: 1598), also known as ‘The Fort of the Caledonians’, is located on the summit of King’s Seat, a key geographical feature in the landscape, located on a bend on the N side of the River Tay. Scheduled monument consent has been granted for three seasons of excavation and five trenches on the site, four of which were excavated in 2017. Trenches 2–3 were completed. Two further seasons of excavation are planned to complete the excavation of Trench 1 and 4 and start 5. The fort’s defences consist of a central citadel occupying the summit of the hill and a series of ramparts enclosing lower terraces. The citadel measures c35 x 22m within what are probably the remains of a thick wall. The entrance is located to the N and there appears to have been a track dropping down to a lower terrace on the W. This track and the terrace are edged by a rampart reduced to a stony bank up to 4m in thickness by 0.4m in height, its S end resting on the lip of a precipitous cliff. Below this terrace, on the W, the approach to the fort is partially blocked by three rampart-like features, which form a flight of terraces levelled into the slope. The hillfort sits on exposed bedrock of the Ben Ledi Grit Formation. Vegetation clearance of the thick rhododendron growth on the hill was carried out by a team of local volunteers in advance of survey and excavation work. 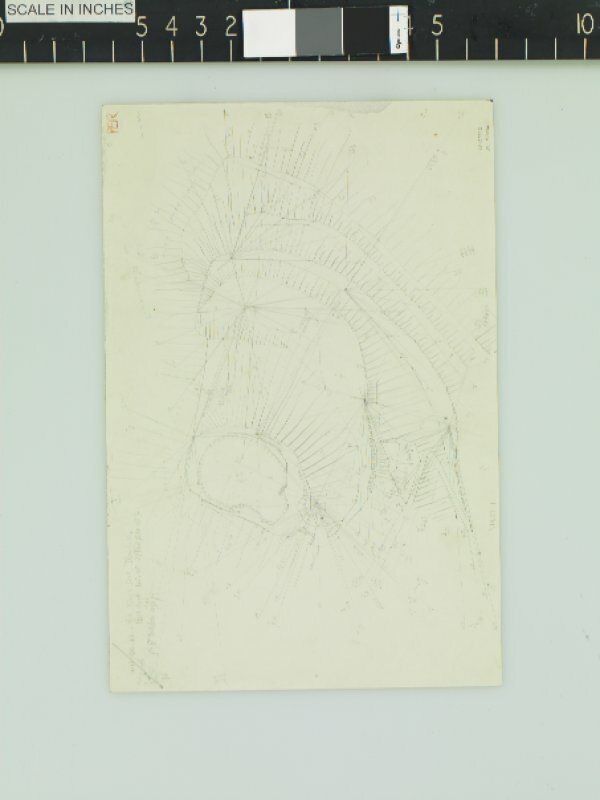 A topographic survey of the site was carried out in advance of excavation to record the main features on the site. From 7–19 September 2017 a team of archaeologists from AOC Archaeology and Perth and Kinross Heritage Trust excavated four trenches on the site with a team of local volunteers. Trench 1 (11 x 3m) investigated the series of ramparts enclosing the lower terraces. The upper rampart was fully excavated and consisted of a bank of large boulders creating a rough outer face and several postholes set back from the inner face. The second rampart was of similar construction but more slumped on the steeper slope. The third lower rampart had been reworked in more modern times as part of a landscaping on the site. Stones had been disturbed and placed along the outside edge of the lower terrace, acting as a kerb for a Victorian track running round and up the hill. A stone mould was retrieved from this trench. Trench 2 (8 x 8m) investigated an area adjacent to the large schist glacial erratic or ‘King’s Seat’ within the summit enclosure. Topsoil or hillwash deposits were shallow here and bedrock was exposed across the whole trench. Although no features were observed within the thin hillwash deposits unstratified finds including one stone mould, several crucible fragments, several flakes of flint and modern shotgun cartridges were all recorded from this layer. Deposits of small round stones were also identified within this layer, grouped in one location near the glacial erratic and confirmed to have been introduced to the site rather than a natural occurrence. These have been tentatively interpreted as ‘slingshot’ stones. Trench 3 (2 x 5m) was placed to investigate the summit enclosure wall immediately to the NE of the entrance. The section here revealed that that low bank visible above the ground consisted of large stones and earth with no coherent face. This feature was slumped and collapsing off the outer edge down the steep slope of the hill. Two fragments of the same stone mould were retrieved from within the bank material. The style of mould, in a ‘mirror’ form was the same as the mould found in Trench 2. Trench 4 was opened and the topsoil removed. Within this mixed layer were large quantities of animal bone, fragments of teeth, claws and horns. Excavation was halted at the interface to the next layer; a charcoal rich horizon containing more stone and possible settings. Artefacts recovered included three stone moulds, two of ‘mirror’ form. After initial research these are similar in form to moulds identified at Garranes, Ireland and Portmahomack, Tarbat amongst others. Several small fragments of crucible were also identified; implying precious metalworking of some form had been taking place. A programme of further excavation and post-excavation analysis, including radiocarbon dating will help define the chronology and possible phasing at the site.